The majority of group breaks companies are honest, upfront, and friendly, however, like every type of business, there are also a few who are less than reputable. In order to help spot the good and not-so-good, we’ve highlighted a few tips and what to look for in a case breaker. Even though these are general guidelines and can be used for many businesses, we sometimes overlook them when it comes to online collecting. This can be especially true if you’re relatively new to group breaks or if you get caught up in the excitement of idea of scoring top-notch cards. The list below contains some key things to keep in mind as you search for the next group break. Don’t worry, we’ll go into greater detail for each while expanding upon others. How long has the person or company been in business? Do they have a well designed and organized website? What type of presence do they have on social media? Have their customers left positive or negative feedback? These may seem to be common sense questions for most people, but newbies may not realize—just as I hadn't—that for the most part people who host breaks do so as a business. Therefore, it is only natural to hold them to the same standards you might hold a brick-and-mortar store. A reputable case breaker should be found on at least two social media outlets. Of course, this is not a hard-and-fast rule, but rather, a good rule of thumb. Why two and not one? 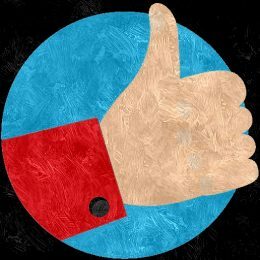 As most can attest, people would rather leave complaints than praises, hence, if the breaker has a presence on more than one social channel, it will be easier to find both good and bad reviews. And, the more avenues a breaker has, the better chance you'll have at finding unbiased feedback. Also, if the person or site is socially active, collectors can take that as a good sign they are on the "up-and-up" with nothing to hide. On the other hand, if their Twitter or Facebook page has little or no activity, this can be a warning flag. Again, keep in mind that this is not set in stone. For example, if someone is just getting into the business and is a new group breaker, it would make sense for them not to have a strong media reputation. Nevertheless, I still recommend being cautious and doing a little more research on the person. This may also be seen as a no-brainer, but a business who has been around for a long time (3+ years) does not equate to the best/worst, and vice-versa for a startup, too. Although, the length of service is certainly a useful tool to help determine how well they conduct business. In addition, the number of years the host has offered group breaks is an indication of how efficient the process is. For example, a well-established case breaker will most likely have everything ready before the live break begins, such as a colleague for sorting, along with top loaders and sleeves. Whereas, a person new to the scene might not realize such things are needed during the event. While this might sound irrelevant to the overall process, and for some it may not be an issue, this can impact how quickly those awesome new hits arrive at your doorstep. Obviously, website design and organization is mainly a personal preference, but there is more to a site than design. This is especially true for new online collectors. Let's say a collector is purchasing a slot for their very first case break. Presumably this person has preset ideas of what he/she believes they are buying (i.e. all team cards). 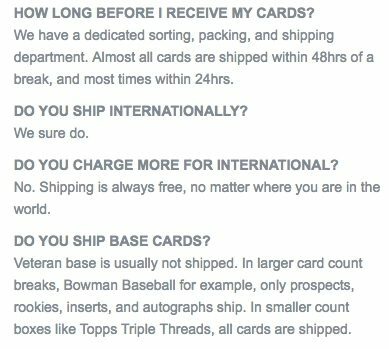 However, as most do not ship base cards if the site and/or break listing does not have this written where it can easily be seen, think of the disappointed completist when they receive a small package (hopefully a box and not a bubble envelope) of cards rather than a full box of cards. Yes, of course, the hits are awesome, but if you thought you were paying $50-80 for a team spot and in line to receive the entire group of cards pulled but didn't, how upset would that make you? Essentially, a user should not have to hunt down the basic, and not-so-basic questions and/or terms. All of it should be together, most likely on an F.A.Q. page. And, in the event that terms vary with different case breaks, that should also be notated in the F.A.Q. section, as well as the individual group break listing. The driving force behind any company, customer service truly falls under every category listed above. From reviews given to feedback on forums or YouTube channels, and everything in between, a case breaker's customer service should be of the utmost concern. Typically, a collector can get a good idea of how well things are handled by looking at the site's Contact Us page. Here is where you'll see, or rather should see, a plethora of information about the company/person. These are a few things you should look for, preferably on the Contact Us page, that reflects how seriously the business handles any issues that may arise. Phone Number: This shows that they consider themselves an actual place of business. You are their customers and are able to call to speak to a person. Hours of Operation: Gives clients a general idea of when they can expect to hear back from the person. Email and/or Send Us A Message: Sometimes a site has both or just one. Either way, they are offering another means of communication. Social Links: Although this has more to do with social presence, it is a good sign they aren't hiding but instead inviting their customers to reach out via a social platform despite what they might say. Have any tips what to look for in a case breaker? Let us know in the comments below! I am breaking sport card boxes for two years. My business has an ERP system but I would like to separate the shop and the breaking business. I would like to know if you could suggest me a good software to controll box and case breaks. 2014 Bowman Sterling Magenta Prospect Autographs Archie Bradley BGS 9.5 Auto 10.